The family of monitors of patients of Life Scope VS of the NIHON KOHDEN company supports a wide set of functions which can be used in many clinical areas. Previously adjusted monitor of the patient of BSM-3000 integrates classical functions and the most modern technologies in one compact device. The Life Scope VS series provides optimum control of a condition of patients at all stages of treatment. 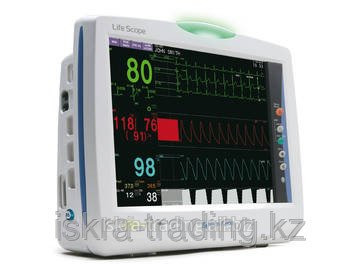 This series includes two different basic models (with the screen 12,1" or 15"), and also supports several technologies of measurement SpO2 (NIHON KOHDEN, Nellcor and Masimo) and can turn on 2 or 3 MULTI sockets. Thanks to a possibility of connection of the module of record of a heat chamber and to 2 external devices (in addition) the Life Scope VS series provides high flexibility, but at the same time does not demand special knowledge at service. Any parameters can be chosen by means of the MULTI socket. The parametrical MULTI socket automatically distinguishes the connected sensor cable then the monitor configures parameter as appropriate and begins measurement process. At the same time separate settings or different modules are not required even if parameter changes. Thanks to it the user has an opportunity to freely select parameters, to save expenses and at the same time to provide effective monitoring of a state of health of the patient. Unbelievable price on Bedside Life Scope VS BSM-3562 monitor in Almaty (Kazakhstan) company Iskra trejding, TOO.